Beating/Breaking Shell opens up new modes of expression through the movement of two bodies and the sound of one violin, attempting to capture a model of the universe in sound and movement and transmit it vicariously into the body of the viewer. Taking the late writings of the poet Sergei Esenin as their starting point, Nigel Osborne and Michael Popper collaborate on a new work for choreographed bass voice and cello (performed by Clea Friend and Michael Popper). With articulate animal and the other ensemble. A series of compelling, improvised miniatures in contemporary music and dance, developed and pre-viewed during a residency at Dance Base. 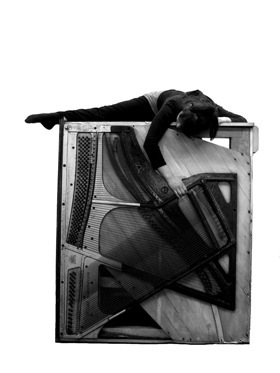 An exploration of the fragments, echoes and traces unfolding within performance, revealing the detail of the moment. musicians: Suzanne Parry (bass clarinet), Richard Worth (flute), Luke Drummond (prepared piano, vibrophone), Chris Greive (trombone).